Queen Anne High School represents a major change in Seattle's education system. Reformers around the turn of the century viewed education as a possible cure for America's social ills. They argued that better schooling required safe, scientifically designed buildings. Seattle's Board of Education was influenced by these ideals and hired James Stephen as the "Official School Architect" in 1899. Stephen developed a "Model School Plan" that was widely copied in Washington State, and the 1909 Queen Anne High School became its fullest realization. A School Board Report claimed this Neo-classical building, situated atop the crest of Queen Anne Hill, "marked the summit of achievement thus far in Seattle school architecture." Edgar Blair, a school board member and later the School District architect, noted "it is the most modern and costly building in Seattle.... [Providing] spacious corridors, ample exits, abundant light and fresh air . . . and toilet facilities on every floor." 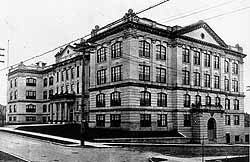 In 1929, with rising enrollment overcrowding Queen Anne High School, the district decided to build an addition to the original school. The character of the 1929 addition exemplifies an architectural shift away from glorifying classical ages toward a celebration of the modern industrial age, with more "functional" schools, more modest in scale and cost. Queen Anne was again enlarged in 1955. In the 1980s, the school district closed the school and sold the building to developers. 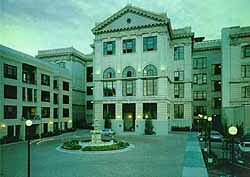 Its purchasers converted the Old Queen Anne High School into 139 high-quality apartments that opened in 1987, a project that used the Federal Historic Preservation Tax Incentive Program to receive $1.6 million in tax credits. Today Queen Anne High School is an excellent example of the adaptive use of historic buildings. The Queen Anne High School is located at 201 Galer St. at the top of Seattle's Queen Anne Hill. The complex is not open to the public. Photograph from Seattle School District Annual Report, 1909-1913.